Note: This post was updated on 14 April 2018 to clarify misconceptions that were written early in its composition. These corrections were addressed back in 2014 in a footnote, but I have incorporated these corrections into the main post now, along with a note describing where the update was made and the initial misconception. The first game we had, which came with the system, was the combination cartridge with Super Mario Bros. and Duck Hunt in one. We picked up others along the way, but Super Mario Bros. was first for me and always felt like the default game, the Platonic ideal of games. I played it enough to etch every one of its nooks and secrets indelibly into my memory, and I can play it with muscle memory today. After the early 90s, I stopped forming any sort of attachment to video games and mostly stopped bothering, but before that, I played Mario with dedication, enough that it feels like every part of the game is carved in stone. Super Mario Bros. is the same everywhere and will never change—or so it seemed when I was younger. I also heard rumors of glitches, ways to make the game do unintended things, which came built into every copy. The most famous one that I know of is the Minus World. 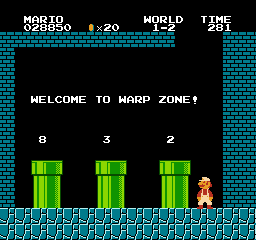 There are warp zones throughout the game which allow you to skip from an earlier world to a later one by going down a pipe. The Minus World glitch required you to get near the first warp zone and then do some weird maneuver that lands you in a glitched version of that warp zone, such that two of the pipes can take you to a world labeled –1, a bizarre Mario hinterland which doesn’t ordinarily exist. I tried and tried, but I never could get that damn glitch to work. Several years ago, though, I figured out a way to get to the Minus World so that I wouldn’t have to bother with the glitch. I did it by directly manipulating the contents of the Super Mario Bros. ROM file. In fact, I was able to tell that warp zone to take me anywhere I liked, including existing and nonexistent worlds apart from the Minus World altogether. I’ll explain in a moment, but first I want to explain the Minus World glitch. In the course of the glitch, the game ends up showing the warp pipe, as you’d expect, and instead of the familiar number above it, instead, it puts a blank space, and then the game goes on to use that blank space as the destination world when you warp. Why a space? That’s because of the way the NES games store numbers, letters, and other symbols. Knowing this, we know that the game ROM file stores a world’s number with a typical number, such as using a five for world 5. When we go to the Minus World, somehow we’re actually going to world 36, and the game displays this as a blank space. When Mario pops out at his destination, the top of the screen shows -1, which looks like a negative one, hence the name for this glitch—the Minus World. How does Mario end up at world 36?2 First, it’s important to know that Mario contains a lot of creative code reuse. This served to keep the game very, very small—as all early NES games were. I see that my ROM, in fact, is only 40,976 bytes. That’s smaller than most webpages. Code reuse probably likely guided the decision for the program code to reuse the the labels above the pipes as the actual destinations as well. In other words, when Mario descended down a pipe which the game knew to be a warp zone pipe, Mario‘s code would check out what number was above the pipe and plug that number directly into the world to which it sent you. Second, it’s important to know that Mario had essentially no error-checking. The original programmers had no room for extraneous error-checking and simply avoided, to the best of their ability, creating erroneous or nonsensical situations in the code. When an error does happen, the game just carries on as best it can until it breaks completely. This allows parts of the game to fragment and coalesce like free radicals, creating new, unintended things. Those two factors make the Minus World possible, and a bug in the collision detection enables players to access it. Here’s what actually happens in the code to trigger the glitch from within the game. First, Mario reaches the exit pipe near the end of world 1–2, but he doesn’t go through it. 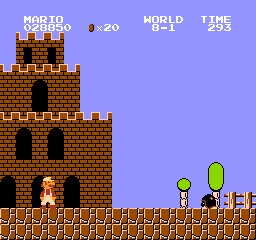 By knocking out a brick above the pipe and jumping in a precise way, the player triggers a bug in Mario’s collision detection which allows Mario to move through the pipe and bricks to the right. Mario emerges at the left edge of the warp zone clearing, near the leftmost pipe there. Note at this point that no label appears above the pipe. The code for Super Mario Bros. does not load the labels for the warp zone until it has fully scrolled into view—try it out sometime when playing normally. So this glitch has essentially allowed us to prevent loading the labels for the warp zone. In other words, we’ve taken a shortcut preventing us from running all the way to the right before dropping into the clearing. That’s the critical part. Mario descends into the leftmost pipe. The code dutifully checks what number is above the pipe. However, that memory is a blank space. Mario reuses the same memory for both what’s on the screen and what destination the pipe goes to. 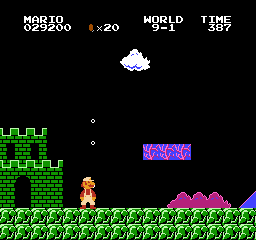 A blank space is represented by a thirty-six, so Mario heads to world 36–1, which the game displays as –1 at the top of the screen. Mario appears in the Minus World. I’m unclear about what happens on the level of the code to create the Minus World, but the experience, as many have learned, is an improbable one: you find yourself swimming through a glitched version of world 7–2 which never ends. Probably, Mario tries to look up which data corresponds to world 36–1 in order to build it and somehow ends up with the wrong one. I’m guessing that the code takes the number thirty-six and tries to count up through a table to look up the world it wants, overflowing and wrapping back around as it goes. (It’s interesting, if maybe irrelevant, to observe that thirty-six divides by seven with a remainder of one.) Whatever the case, those are the details I know about how the Minus World works. Like I said, I never managed to get that glitch to work. I wasn’t dextrous enough, I guess. You can find videos of it online, but back when I was attempting it, I never managed it. I did get curious about how it all worked, enough to figure out what I said above. I realized then that within the ROM, there must be a kind of table, with three-number combinations describing the possible destinations for each warp zone. The Mario ROM being itty-bitty, as I said, I just opened it up in a hex editor (a program that lets you edit the data in a file directly in numerical form) and searched for the sequence of numbers representing the first warp zone: four, three, and two, in that order read from left to right in the actual game. It didn’t take too long to find such a sequence, and luckily, this three-number sequence only recurs a few times. Look at the screenshot up above. It’s in hexadecimal3, but the number sequence looks pretty straightforward. For those who can’t see the screenshot, the line of numbers reads FF 15 1E 10 12 04 03 02 00 24 05 24 00. Among the seeming garbage, the sequence 04 03 02 is easy to spot. But look, there’s another clue! Right after the numbers I wanted, there’s a zero, and after that, a thirty-six, a five, and another thirty-six.4 Does that sound familiar? It’s the next warp zone! So we’re definitely on the right track. But if we want to be sure, there’s only one real way to know. I changed 04 03 02 to 08 03 02 and ran the game. Sure enough, I saw what I was looking for! And just to make sure the hack did indeed work, I had to go down the pipe, of course. Success! I can hack the warp table and go to any world I want from the first warp zone. This has possibilities! I realized I could then edit 08 03 02 to be anything I wanted, including the Minus World (24 03 02). But even more, I can put in numbers to worlds nobody has ever seen. I wanted to see world nine and play it, so I put in 09 03 02. Haha, world nine, as it turns out, is ridiculous. You can actually swim through the world all the way to the end. It’s kind of wild. I tried several other worlds, most of which were alphabetical. Each one is different and broken in its own way. Some strongly resemble existing worlds with little twists (weird gray blocks all over, gray spits from the castles in random places). Some are like world nine, something which should never have seen the light of day and which only barely work (I note that my emulator I used for making screenshots actually froze up). Some are blank and don’t work at all. I won’t spoil these other worlds with screenshots. You know enough to see these worlds for yourself now. 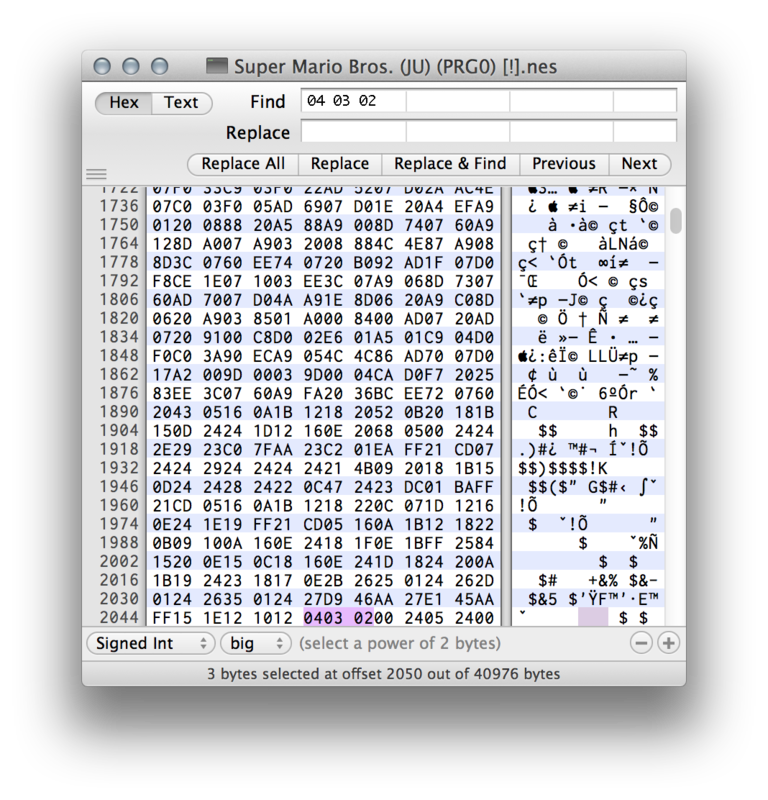 All you need is a Super Mario Bros. ROM, an emulator (I recommend OpenEmu on OS X), and a hex editor. Go hack! In case you’re not up to speed with the current state of emulators, something of a quick, technical recap may be in order. The NES was a very simple computer with a 6502 processor and some custom graphics and audio hardware. Games came on cartridges called Game Paks, which bundled up instructions for those computers written in the 6502 assembly language, sometimes along with an extra chip called a Memory Management Controller which augmented the capabilities of the game. During the 90s, fans of the NES began writing software specifically to execute the same instructions as the original NES processor, adding in video and audio capability the same way. Using specially designed hardware, they could dump the instructions from the physical cartridges onto a file on disk, which could then be read by the software. The software was known as an emulator because it sought not only to give the same experience as playing the original game (which would be a simulation) but to emulate the hardware which created it to give an identical experience, or as close as possible to it. Nowadays, these dumps of the cartridge data (known as ROMs) and the emulators which load and run them are commonplace and popular, capable of being run on computers, tablets, and phones so you can experience something a lot like playing the original games. The upshot of all this is that the games I played when I was really young are now tiny files on disk, able to be read and changed just like any other file. There are communities of people who hack existing games, slightly or dramatically, or even create entire new games or other projects meant for execution on an NES from whole cloth. There’s an entire music genre dedicated to manipulating real or manipulated hardware, for example. People have done other fascinating things, but I just want to talk about one game here. Update: This paragraph has been changed to correct misconceptions it contained when I originally wrote it. I had originally put this correction in a side matter note later on, but it felt more important to describe the correct mechanism from the beginning. 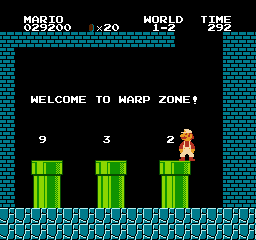 For the sake of disclosure, my original conjecture was that, because the game has multiple warp zones, the Minus World glitch was triggering the wrong warp zone to load somehow, causing blank labels to appear above a warp zone pipe. To find out what really happens, I found a the game’s 6502 instructions disassembled and annotated and read those. Therefore, the explanation here is based on that disassembly. For technical reasons, it’s often easiest to edit files numerically using hexadecimal numbers. When counting in hexadecimal, the first ten digits look as you’d expect, but letters are used for the last six digits. Not to worry, they’re all ordinary numbers, just more of them before you get to two-digit numbers.